Last night I got schooled. 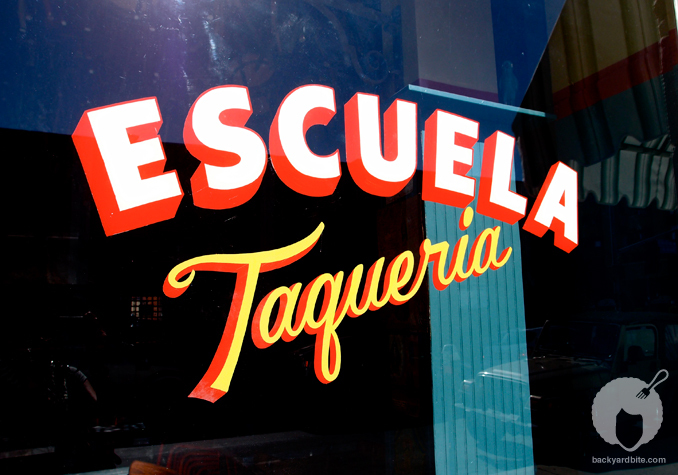 I celebrated Cinco de Mayo at a special soft opening of a new neighborhood taco shop, Escuela Taqueria. Brought to you by restauranteur, Steven Arroyo, he continues to do what he does best; simple and savory eats. He had been testing the waters, serving tacos during the evening at his sandwich shop, Potato Chips and had been planning and prepping for Escuela for over a year. Not too far from the popular tapas restaurant, Cobras and Matadors and the yummy sandwich shop, Potato Chips, Escuela is Arroyo’s third restaurant off Beverly Blvd. Located on Stanley Ave., this is a super small, super cute little shop that pretty much, for now, serves only tacos. There are about 10 tables inside which seat about 20 comfortably. There are a few tables for outside feasting, but this place is minimal, so leave the big group at home. There are also a bunch of chairs dangling from above to add a bit of danger to your meal. You can’t help but imagine… I wonder what would happen if there was an earthquake right now… this is Los Angeles after all. There’s the standard rice and beans or a side of chips and guacamole to help fill your appetite. The tacos are “classic street style”, and by that I mean “smallish”. I’m glad I came with a pal so we could order a few for variety. 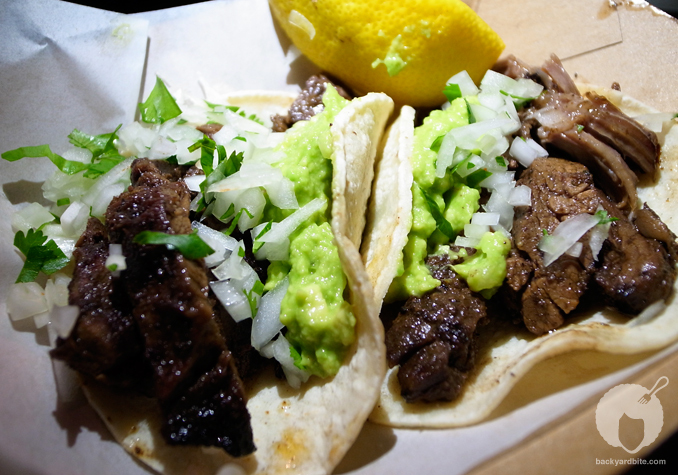 I loved the Carne Asada tacos which were super tender and delicious. The Chicken Taco was simple and solid but nothing to fan fare. I ended up adding a bit of the salsa to add some more kick. 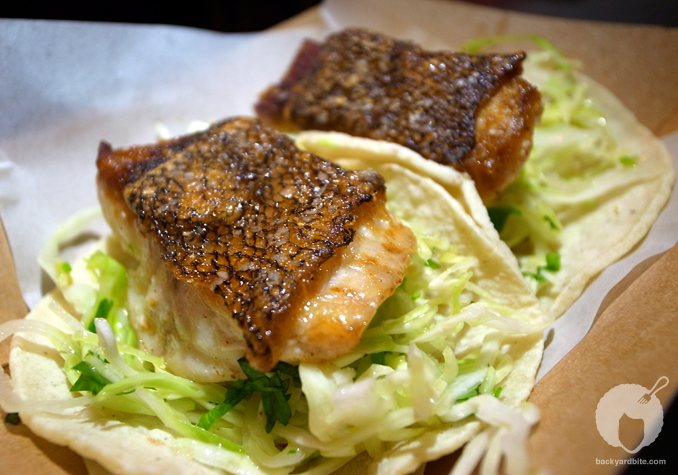 The Avocado and Sea Salted Pork was very good yet the winner of the night was the Bass Taco. The Bass was cooked perfectly and the crispy skin was finger licking good. I’d order this one twice. As for drinks, they do have a small variety of colas and agua frescas. My neighbors to the right of me sipped on 6 oz Pacifico “cuartito”. You’re paying a bit more than street prices for these “gourmet” tacos but the quality is there. This special opening was just a taste of what is to come I’m sure. Executive Chef Aaron Dubois wanted to interweave some of his French-Mexican influences and bring a little gourmet twist to the standard taco eatery. 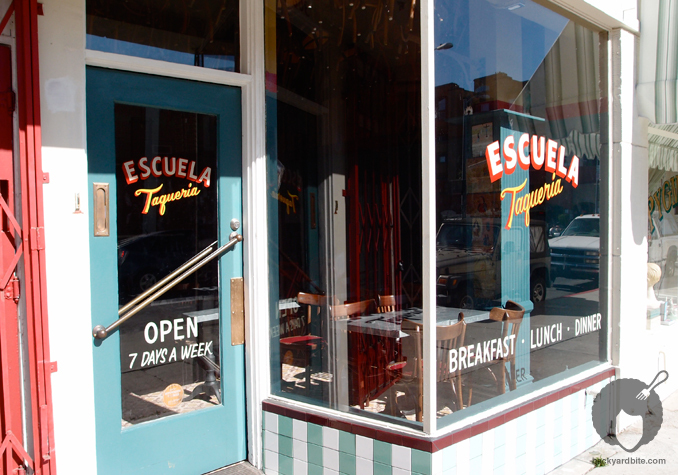 Escuela should be rolling out in full force very soon and I can’t wait to see how they expand the menu. Ooo! Right heer on Stanley huh? I’m going there tomorrow! Thanks for the tip! They don’t actually open to the public until next week sometime. 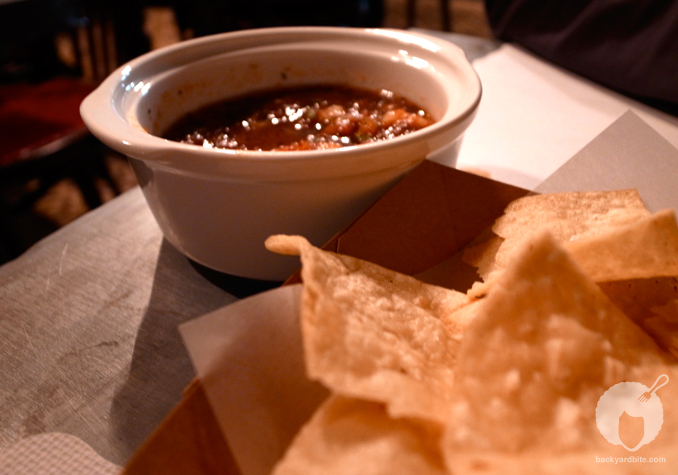 Give Potato Chips next door a call before you head over to make sure they are indeed open! Will this place EVER open? It’s getting ridiculous. Drove by there yesterday and saw some chairs and tables outside. I think they have FINALLY opened for business!